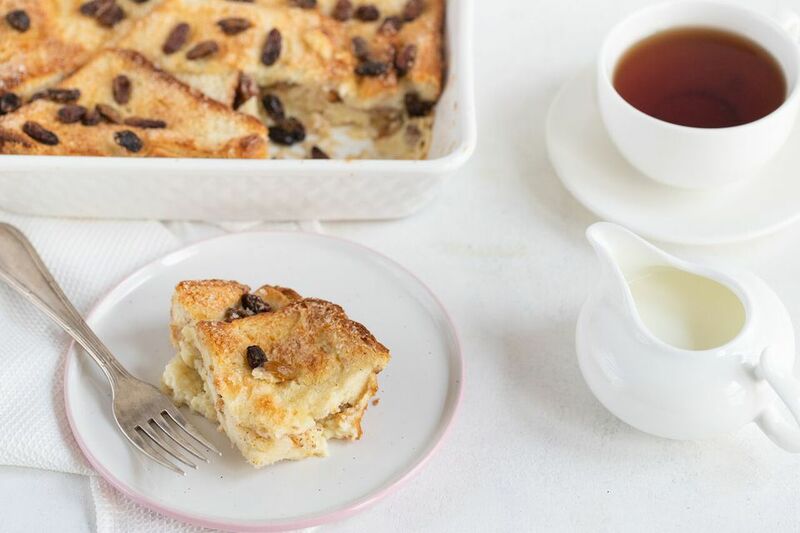 There is barely anyone who does not love a good bread-and-butter pudding. It is one of those desserts that made British puddings the envy of the world and is centuries old. With this recipe, milk, cream, and egg-soaked bread are transformed into a light, custard-like pudding in a mere 40 minutes in the oven. One of the best things about these types of desserts is it is an excellent way to use up leftover white bread, making this a very economical dish to cook. This same recipe can be made with Italian panettone, croissants, brioche, brown, bread, even Hot Cross Buns. In fact, any bread can be adapted depending on your taste, except maybe heavy dark breads. The method is the same whichever you use. Heat the oven to 355 F/180 C. Grease a 1 quart/1 liter dish with a little of the butter. Spread one side of each of the bread triangles with remaining butter. Cover the base of the dish with overlapping triangles of bread, butter side up. Sprinkle half the golden raisins/sultanas evenly over the bread, then lightly sprinkle with a little nutmeg and cinnamon. Repeat this layer one more time or until the dish is filled, finishing with the raisins on top. In a saucepan, gently heat the milk and cream, but do not boil. Set aside. In a medium-sized heatproof bowl, beat the eggs with 3 tablespoons of the sugar and the vanilla extract until light, airy, and pale in color. Slowly pour the warm (not hot) milk over the eggs, whisking continuously, until all the milk is added. Pour the egg mixture slowly and evenly over the bread until all the liquid is added. Gently press the bread down into the liquid. Sprinkle the remaining tablespoon of sugar over the surface and set aside for 30 minutes. After 30 minutes, bake the pudding in the hot oven for 40 to 45 minutes, or until the surface is golden brown and the pudding is well-risen and the eggs are set. Bread-and-butter pudding reheats well covered with aluminum foil in a hot oven. It's also delicious cold, cut into large wedges—perfect for a lunch box. Use a vanilla bean instead of the extract by splitting it open and scraping out the seeds. Add the seeds to the milk and cream before heating. Let infuse for 5 minutes before straining the milk over the beaten eggs.